For centuries, the Scala Santa (Holy Stairs) have attracted Christian pilgrims who wished to honour the passion of Jesus. The stairs are, reputedly, the stairs from Pilate’s residence in Jerusalem that Jesus ascended to be judged by the Roman procurator and then condemned to death. 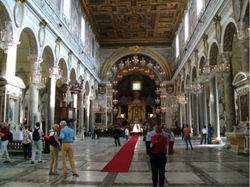 Tradition says they were brought to Rome and located in the complex of buildings around the Basilica of Saint John Lateran. The stairs lead to the Sancta Sanctorum, the personal chapel of the early Popes, where papal relics and an ancient image of Jesus Christ have been kept for centuries. This basilica was constructed on the Arx, one of the peaks of the Capitoline Hill. Legend has it that it was here that the Virgin Mary appeared to Octavius before he became Emperor Augustus. The church took the place of the ancient and very important Temple of Juno Moneta. The early basilica was much like the present building’s transept. It was constructed in the 13th century for the Franciscans, probably following the design of the great architect Arnolfo di Cambio. 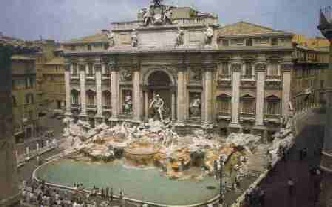 It may not be the most beautiful fountain in Rome, but it is without doubt the most famous. Pietro da Cortona and above all Bernini, who began the undertaking, both had a hand in the project. The death of Pope Urban VIII brought work to a standstill and not until about 100 years later Clement XII entrusted the work to Nicola Salvi, who finished the undertaking between 1732 and 1751. 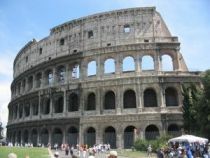 The Colosseum, originally known as the Flavian Amphitheatre, is the largest amphitheatre built in the Roman Empire. Originally capable of seating 50,000 spectators, it was once used for gladitorial combat. It was built in the 70s AD. The Catacombs of Saint Sebastian were not only the original final resting place of its namesake, but also held the bodies of Saints Peter and Paul until the reign of Constantine. Visitors can walk through the tunnels and study the mosaics, mausoleums, and even ancient graffiti. Both Christians and pagans were buried in the these catacombs, making them unique in that aspect.